Sanditon (1817) is an unfinished novel by the English writer Jane Austen. 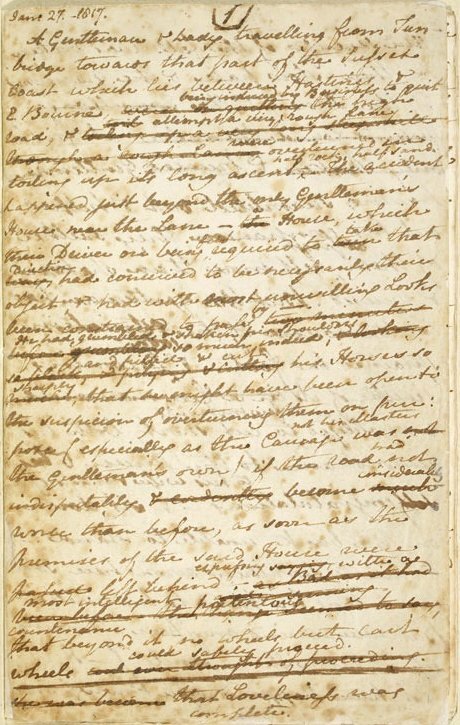 In January 1817, Austen began work on a new novel she called The Brothers, later titled Sanditon upon its first publication in 1925, and completed twelve chapters before stopping work in mid-March 1817, probably because her illness prevented her from continuing. A gentleman and a lady travelling from Tunbridge towards that part of the Sussex coast which lies between Hastings and Eastbourne, being induced by business to quit the high road and attempt a very rough lane, were overturned in toiling up its long ascent, half rock, half sand. The accident happened just beyond the only gentleman’s house near the lane—a house which their driver, on being first required to take that direction, had conceived to be necessarily their object and had with most unwilling looks been constrained to pass by. He had grumbled and shaken his shoulders and pitied and cut his horses so sharply that he might have been open to the suspicion of overturning them on purpose (especially as the carriage was not his master’s own) if the road had not indisputably become worse than before, as soon as the premises of the said house were left behind—expressing with a most portentous countenance that, beyond it, no wheels but cart wheels could safely proceed. The severity of the fall was broken by their slow pace and the narrowness of the lane; and the gentleman having scrambled out and helped out his companion, they neither of them at first felt more than shaken and bruised. But the gentleman had, in the course of the extrication, sprained his foot—and soon becoming sensible of it, was obliged in a few moments to cut short both his remonstrances to the driver and his congratulations to his wife and himself—and sit down on the bank, unable to stand. His wife fervently hoped it was; but stood, terrified and anxious, neither able to do or suggest anything, and receiving her first real comfort from the sight of several persons now coming to their assistance. The accident had been discerned from a hayfield adjoining the house they had passed. And the persons who approached were a well-looking, hale, gentlemanlike man, of middle age, the proprietor of the place, who happened to be among his haymakers at the time, and three or four of the ablest of them summoned to attend their master—to say nothing of all the rest of the field—men, women and children, not very far off. “Then, sir, I can bring proof of your having a surgeon in the parish, whether you may know it or not. Here, sir,” (taking out his pocket book) “if you will do me the favor of casting your eye over these advertisements which I cut out myself from the Morning Post and the Kentish Gazette, only yesterday morning in London, I think you will be convinced that I am not speaking at random. You will find in it an advertisement of the dissolution of a partnership in the medical line in your own parish—extensive business, undeniable character respectable references wishing to form a separate establishment. You will find it at full length, sir,”—offering the two little oblong extracts. In a most friendly manner Mr. Heywood here interposed, entreating them not to think of proceeding till the ankle had been examined and some refreshment taken, and very cordially pressing them to make use of his house for both purposes. The young ladies approached and said everything that was proper to recommend their father’s offers, and in an unaffected manner calculated to make the strangers easy. And, as Mrs. Parker was exceedingly anxious for relief, and her husband by this time not much less disposed for it, a very few civil scruples were enough; especially as the carriage, being now set up, was discovered to have received such injury on the fallen side as to be unfit for present use. Mr. Parker was therefore carried into the house and his carriage wheeled off to a vacant barn.